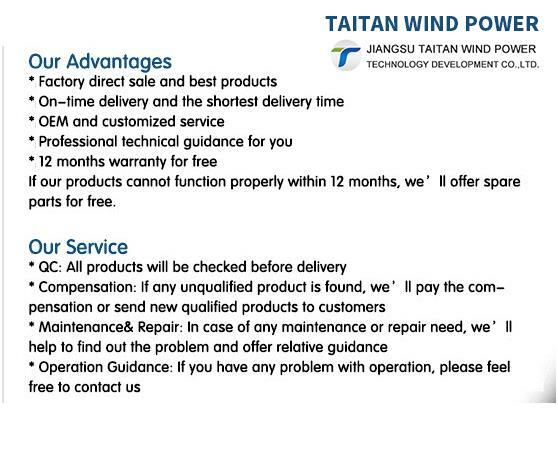 Titan New Energy Technology Developmen Co.,Ltd is a technology-oriented enterprise combined with the design, manufacture and sale of new energy production. T he increase of glass fiber reinforced plastic rotor blades, match with optimization of aerodynamic design and mechanism design, start wind speed is low, high wind energy utilization coefficient, increase the power generating capacity. Power generation using the patent technology of ndfeb permanent magnet alternator rotor, stator of special design, reduce the resistance torque of the generator,. Stern rudder adopts the design of automatic yaw, stronger ability to resist the typoon, safe and reliable operation. Selection of anticorrosive epoxy zinc-rich primer and polyurethane enamel, UV and acid rain resistance, salt fog.